Have you ever heard of a crisp butty? To me it still sounds strange. Over here in the UK, potato chips are called crisps. And a crisp butty is a potato chip sandwich. Yes, it really is a thing. For a while there was even a pop up restaurant in Belfast that sold them in a variety of flavours. 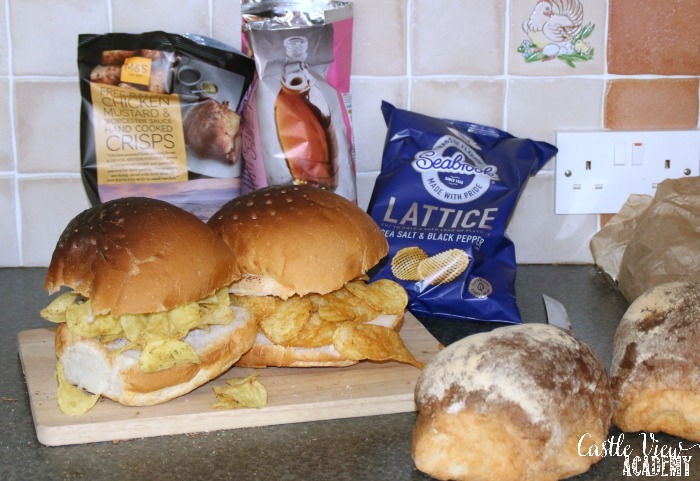 This year when Mom and Dad came to visit I thought I’d give them a new experience and make them a crisp butty for lunch. 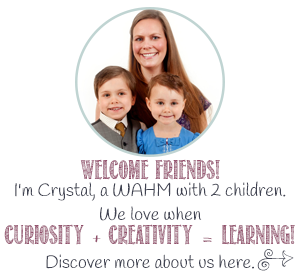 I hadn’t actually planned on making these. But we all went into Belfast one morning for Mom and Dad to visit St. George’s Market and have a wander around the city. I had some things I needed to do in Belfast as well, so I went along as well. As I had to pass St. George’s market on the way from the train station to the city centre, passing the art work, the crafts, books, and all sorts of interesting wares, in the back half of the market, I moved towards the doors at the front, then passing all of the food vendors along the way. 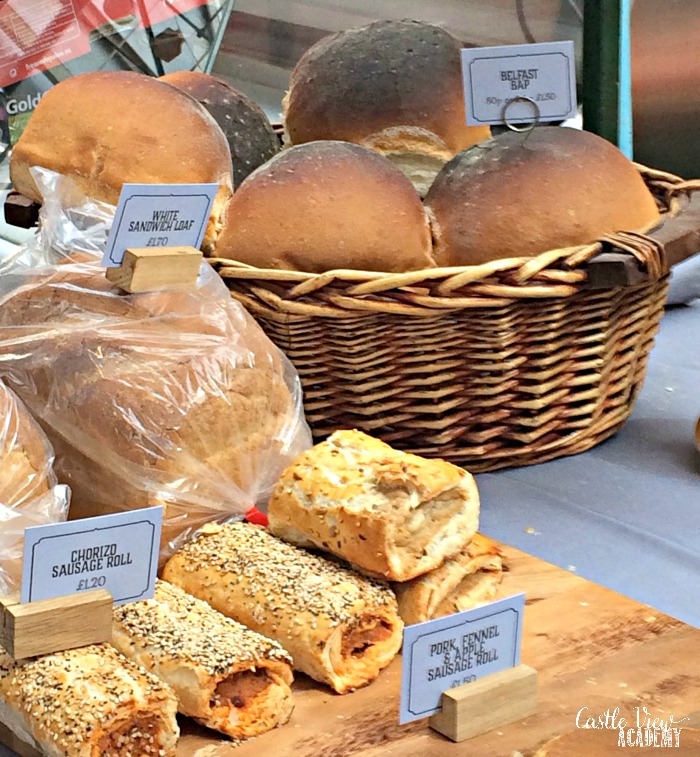 I couldn’t help but stop at this vendor with fresh made baking. I mean, check out the size of those Belfast Baps! What’s a Belfast Bap? They were created by Barney Hughes, a prominent baker during times of famine to help those families who could barely afford to eat. Now knocking on a hundred years later, they’re still found in bakeries and grocery shops around the country. If you can believe it, until this day, I had never had the pleasure of trying one myself. I purchased two as they were so large and went on my way (by the way, the tops are supposed to be dark like that; it’s the way all Belfast Baps are made). 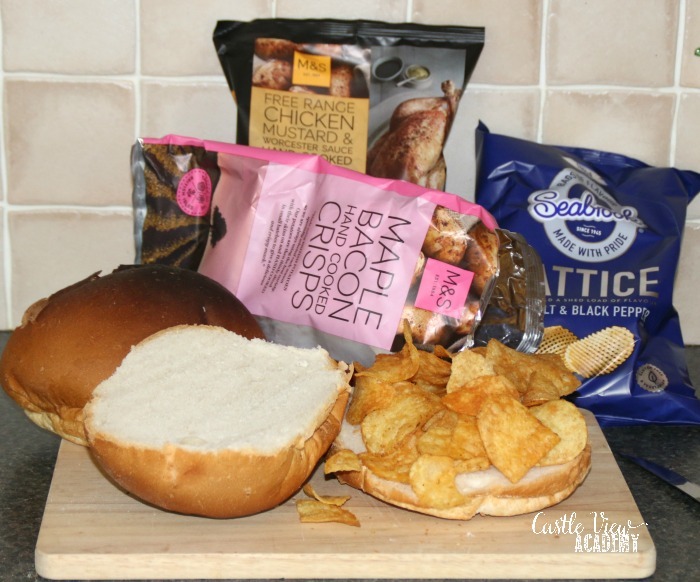 I later thought that these baps would make good crisp butties while I was in Marks & Spencer’s so I bought two bags of crisps that I thought would make good fillings and were different flavours to what Mom and Dad would have back home in Canada. Then I thought….two baps aren’t going to feed 6 of us. But the market was already closed for the day so I picked up another two in a shop, but they just weren’t the same. They weren’t the same overly-generous size, they weren’t freshly made by hand, they were packaged in plastic and thus didn’t have a nice crusty top, either. But they had to do on this occasion. Now, what to do? I hadn’t eaten or made these before. I sliced the baps (the Norn Iron word word for buns; buns here refer to things such as squares and cupcakes. Check out my post on Northern Ireland food slang. Then I loaded them up with chips crisps. Now, some would say that in order to make this a truly Northern Irish dish it would require Tayto brand crisps; but I went with the ones that were where I happened to be and were more distinct in flavour than Canadian brands. I used Free Range Chicken with Mustard and Worcester Sauce, and Maple Bacon flavours. And I had some salt and pepper flavour handy from a Degustabox delivery in case anyone didn’t like the other flavours. Phil then told me they should have had butter; but it was too late for that after he’d devoured his! This was a different experience for me – tough bap crust, then a fluffy inside and then a sharp crispy crunch and bang of of flavour from the crisps. 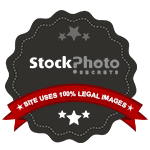 Not generally the textures I go for all at once. I’m definitely glad I tried this, but I’m not sure I’d do it again as it’s not the most healthful meal, that’s for certain. Adding some veggie sticks and yoghurt dip, milk, and fruit for desert would be good for picnic suggestion, or even a party buffet at any time of the year. In a pinch for a special treat, a crisp sandwich could be done as a travel lunch. 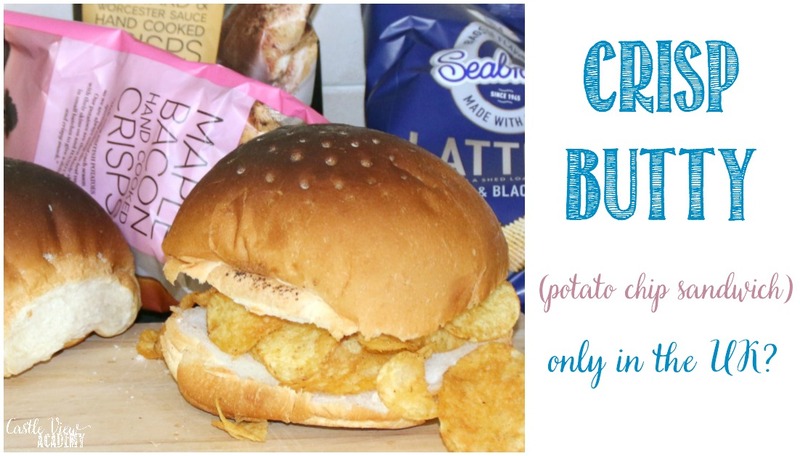 On a previous visit years back Mom and I were in Larne with the children and stopped for lunch and Mom saw a chip butty on the menu and ordered that out of curiosity…I’ll share that recipe with you another day. 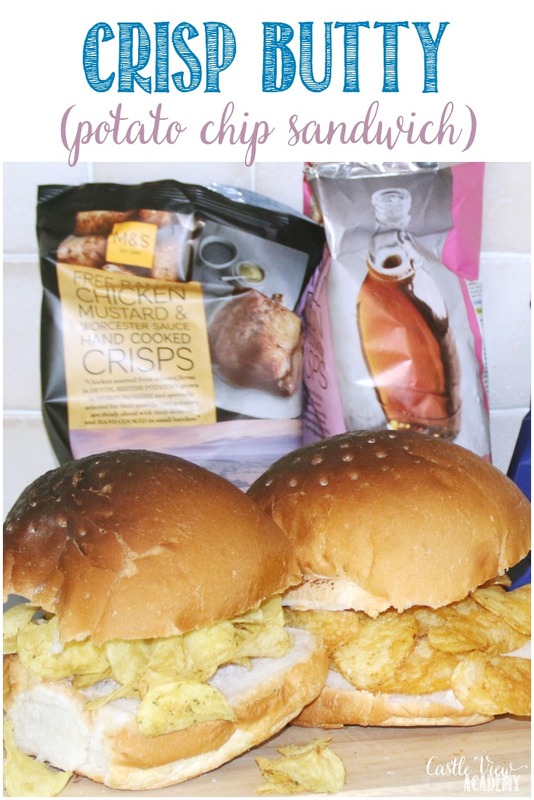 Have you ever tried a crisp butty? What’s your favourite flavour? 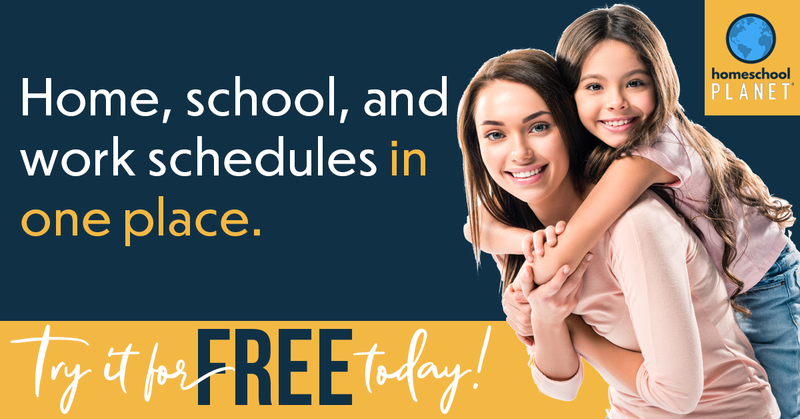 Share it with me in the comments, I’d love to hear about it! 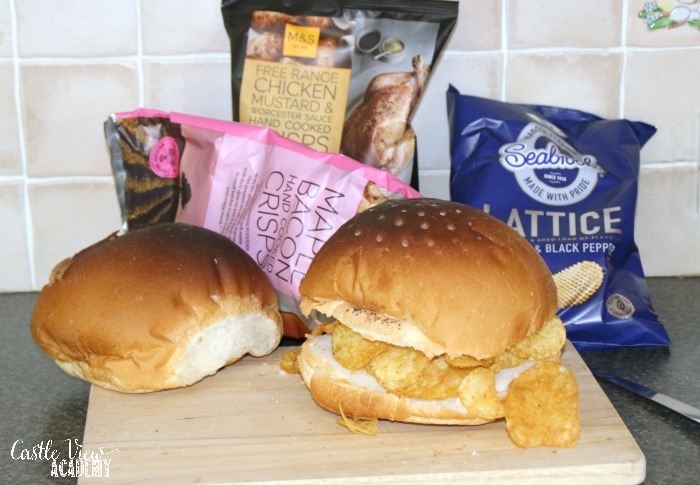 What was your crisp flavour of choice in your sandwich? Did you use regular bread? I’m curious!